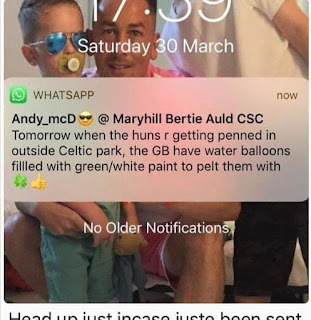 Celtic’s ultra fans the Green Brigade are planning a ‘paint bomb’ attack on Rangers fans tomorrow, while the visiting fans are being herded like cattle by the police to their ‘holding pen’ at Parkhead. The visiting fans, and police, might do very well to be wary of this planned attack to hurl apparent paint bombs at the arriving Blues, given anything could be inside these projectiles beyond the seeming green paint. Their plan, as you can see, is to cover the visiting supporters in green for ‘humiliation’ purposes but Police Scotland would do better to scupper this plan before it comes to fruition at all. Of course, the best answer to all of this is a win on the pitch – nothing else shuts Celtic fans up quite like a goal halfway during YNWA. Wouldn't you have to throw them someone who can read, as well?